Welcome to District 12: Entertainment Weekly calls Comic-Con Mockingjay Pin "Most Essential Single Piece of Swag"
Entertainment Weekly calls Comic-Con Mockingjay Pin "Most Essential Single Piece of Swag"
Handed out by Lionsgate in honor of next year’s film adaptation of The Hunger Games, and utterly inescapable by Saturday. Yea, so we are all really jealous. So I guess the question is, how the hell do I score one? Well one way is to enter giveaway contests that blogs such as The Hob is holding. I'll be posting other giveaway contests that are available as they show up. 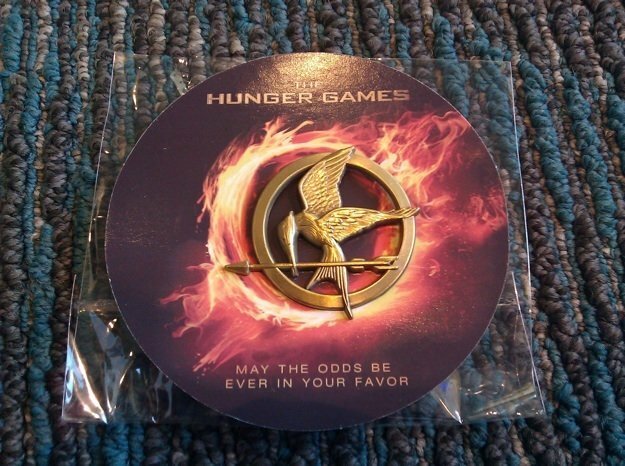 Lastly, tons of people are still selling these pins on Ebay (I searched "Hunger Games", "Comic Con Hunger Games" and "Mockingjay Pin"). I was so desperate for one, I paid $20 for one. Good luck!